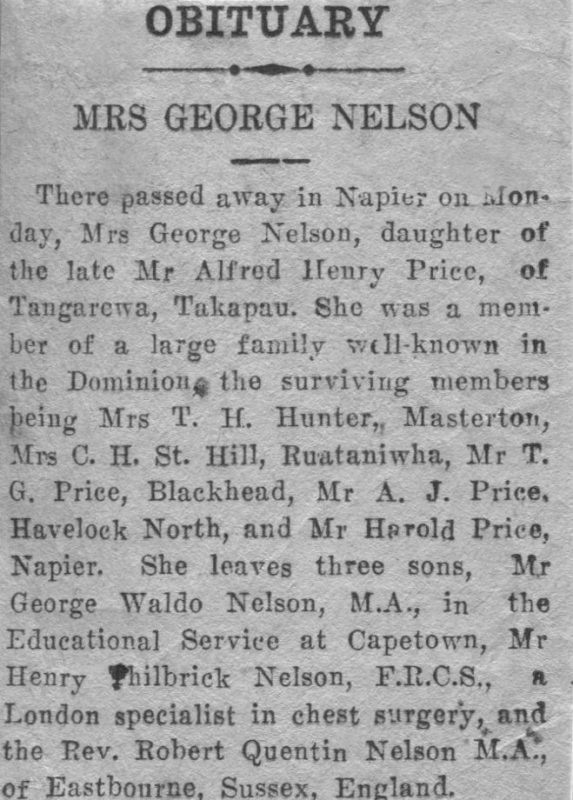 There passed away in Napier on Monday, Mrs George Nelson, daughter of the late Mr Alfred Henry Price, of Tangarewa, Takapau. She was a member of a large family well-known in the Dominion, the surviving members being Mrs T.H. Hunter, Masterton, Mrs C.H. St. Hill, Ruataniwha, Mr T.G. Price, Blackhead, Mr A.J. Price, Havelock North, and Mr Harold Price, Napier. She leaves three sons, Mr George Waldo Nelson, M.A., in the Educational Service at Capetown, Mr Henry Philbrick Nelson, F.R.C.S., a London specialist in chest surgery, and the Rev. Robert Quentin Nelson M.A., of Eastbourne, Sussex, England.